FATE: Killed in Action, 8 August 1915, Gallipoli, Turkey. “DIED ON SERVICE.” The Age (Melbourne, Vic. : 1854 – 1954) 23 Sep 1915: 13. Web. <http://nla.gov.au/nla.news-article154996121&gt;. Thomas Waddell Cameron was the son of Alexander Francis Cameron and Elizabeth Waddell and was born in Port Fairy in 1890. Alexander was a coachbuilder and moved his family to Hamilton, settling in Scoresby Street with Thomas attending Hamilton State School and Elementary School. At some time between finishing school and 1913, Thomas moved to Kyabram and worked as a grocer at Mr Pratt’s store. 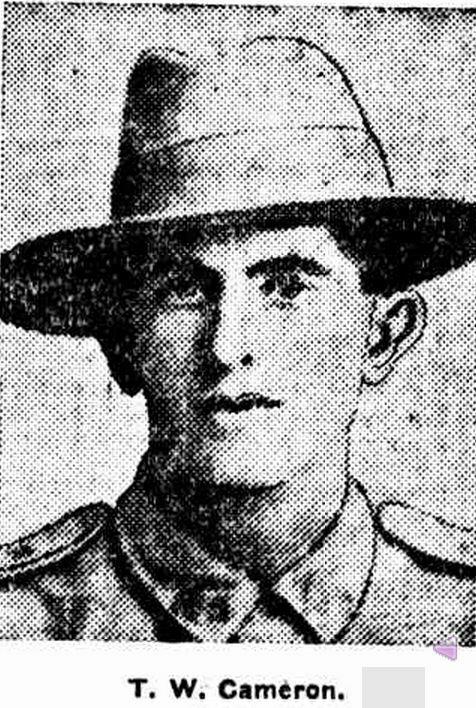 On 31 October 1914, Thomas enlisted at Tatura and within two months was leaving for overseas. Thanks to letters Thomas wrote in diary form and published in the Kyabram Guardian in 1915, we can read of the departure of HMAT Ulysses on 22 December, arriving at Albany, Western Australia and then the passage through to Egypt. The Guardian published a letter from Thomas, also known as ‘Wad’ on 11 May 1915, with Thomas writing he was off to the Dardanelles the following day, “…the place where the lead-pills fly through the air; the fun begins.” On 10 June, he wrote a letter home and the trenches were far from fun. He complained of the mud, rusty rifles and the cold and discovered as he wrote, with bullets whistling over his head, he was sitting on a bull ant’s nest. Despite those discomforts, it came across he was still in good spirits. On 8 August, the 14th Battalion was part of the attack on Hill 971. Thomas was killed during that attack and his body was not found. He is remembered at the Lone Pine Memorial, Gallipoli, Turkey. News of Thomas’ death was felt in Hamilton and Kyabram. A memorial service was held at the Kyabram Presbyterian church and he is remembered on the town’s honour roll. In Hamilton, as Thomas attended Hamilton State School, a tree was planted for him along Hamilton’s Anzac Avenue. He was also named on the State School and Elementary School rolls of honour and had a tree planted in the Clarke Street Avenue of Honour in Hamilton. Danger or not — they are there.